Don’t place too much emphasis on age – you can hire a young nanny if they’ve been in the field of childcare for a few years and have the background necessary to care for children. 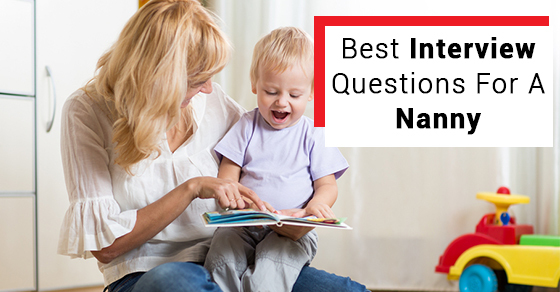 The most important questions to ask will be about their childcare knowledge, their professional experience, and their beliefs regarding child rearing to ensure they don’t conflict with your own. Do you have first-aid, CPR or emergency training? A good nanny will have or be willing to get the proper training in place to deal with immediate emergencies. If they have not had emergency training, ask them if they would consider taking the necessary courses to become certified. You should also ask the potential nanny to describe how they would react in a particular situation, for example, if your child got sick or had an accident. This is particularly important if your child is asthmatic, has allergies that require the use of an EpiPen or is diabetic. Why are you looking for a new nanny position? There are a number of reasons why a nanny would be looking for a new position. The children might have grown to an age where a nanny is no longer required, or the family they were working for moved. However, if any of the nanny’s reasons seem suspicious, such as conflicts with previous employers, you may not want to investigate further. Besides asking why the candidate chose to work as a nanny and what pleases them about their job, you should ask them what they dislike about being a nanny. This will help you to see if they would be a good fit for your home. What are your rules and how do you deal with discipline? You want your child to learn good values and how to follow rules. You also want your child to be disciplined accordingly when they break a rule. However, there are limits and you want to make sure that your potential nanny is in line with your discipline methodologies. Moreover, you should ask your potential nanny how they deal with difficult situations such as a crying or upset child. You should know what your potential nanny is expecting in terms of compensation. You will also need to ensure that the salary you have in mind for your future nanny is reflective of the position responsibilities and hours you are trying to fill. You should also run a background check on your potential nanny and contact their references. Asking the above questions will help in finding the right match for your family.